Trans Manchurian Route Description. Stop along the way. Trip to Transiberian raiload. Tour to Transsib. Trans Sib. Trans Manchurian Route Description. The town of the Trans siberian railroad. Stop along the way. Trip to Transiberian raiload. Tour to Transsib. Trans Sib. 1d 6h 30m The center of Tyumen region — the oil & gas center of Russia. 1d 12h 30m The closest place to Kazakhstan of the route: about 100 km. 4d 10h 0m The city was founded in 1935 along the banks of the river Ingoda. 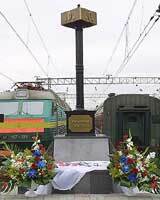 The city is on both the Trans-Siberian and Trans-Manchurian lines. The stop is 25 minutes. 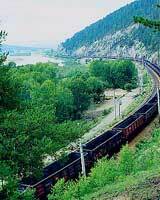 Here the train crosses the river Onon and passengers can make good pictures of the river and surrounding steppe. The stop is 10 minutes. Borzya was founded in the XVII century. 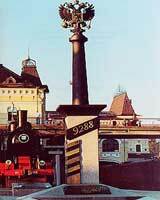 In 1899, it is became a popular trade and transport center. Nowadays it is still an important spot for traders. The stop is 19 minutes. The town is quite close to the Chinese border. Here, the wheels of the train are changed to fit the different gauge Russian or Chinese tracks. The process takes from two to six hours. During this time, you may want to take a walk but if you do, remember to bring warm clothes. In Soviet times, taking pictures at this station was strictly forbidden but now it is usually allowed just don’t try to take pictures of guards or military objects. Be prepared to go through customs and passport control when entering or leaving China. If you are just arriving to Russia from China you will need to fill in a health declaration. The stop is 26 minutes. Along the way to Hailar, you can admire the endless steppes and mountains on the route. The stop is 6 minutes. Boketu is located in Inner Mongolia, an autonomous region of China. The population of the region is 23 million people (79% of Chinese, 17% Mongolian and 4% others). The stop is 8 minutes. Harbin is one of the major cities of China and Northeast Asia. It lies on the southern bank of the Songhua River. Harbin is an industrial city but still has charming architecture. It could be called an oriental St. Petersburg because of the great Russian influence which dates back to the time of the construction of the railroad. Harbin has also been chosen to host the Winter Olympic Games in 2010. The stop is 15 minutes. Capital of the Liaoning province with a population of 7.2 million, Shen’yan is famous for the Mukden Palace - a former imperial palace of the Qing emperors which is now a museum protected by UNESCO. The stop is 15 minutes.